The Genie Company has manufactured garage door opener parts for Screw Drive, Chain Drive, Trac Drive, Chain Glide, and Excelerator garage door openers under several brand names. This page displays Garage Door Remotes, Keyless Entry Systems, Safe-T-Beam Systems, Reapir Parts, Closed Confirm™ Remotes, Wall Controls, Universal Radio Kits, Secoder/Sequensor Boards, Power Heads, Accessories, and Lubricants for Maintenance that are for sale, in stock, and ready to ship. 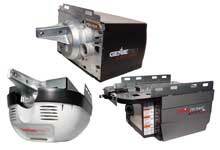 All of the items we offer are compatible with these brand garage door opener names and types.